Fujitsu today announced it has developed five Zinrai-related services that are being rolled out incrementally in Japan, helping customers accelerate their use of artificial intelligence. These services are based on the company's foundation of AI technology and knowledge, and are part of the "Human Centric AI Zinrai" framework, Fujitsu released November 2015. Fujitsu is positioning these services on its FUJITSU Digital Business Platform MetaArc, which works to accelerate the business innovation of customers. 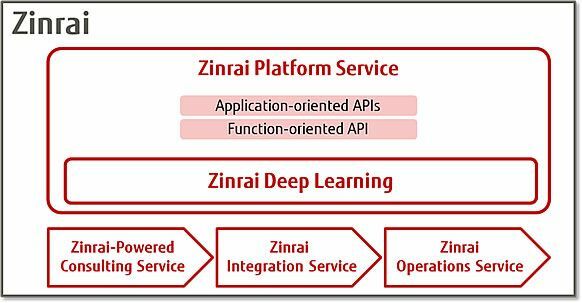 The services being introduced are FUJITSU AI Solution Zinrai Platform Service, which offers 30 AI functions in API(1) form, developed in over 300 AI-related projects and field trials; FUJITSU AI Solution Zinrai Deep Learning, a deep-learning platform service that implements the world's fastest class of deep-learning processing; and FUJITSU AI Solution Zinrai Consulting Service, FUJITSU AI Solution Zinrai Integration Service, and FUJITSU AI Solution Zinrai Operations Service, for total support to customers on AI, from consulting to deployment and operations. Zinrai Platform Service and Zinrai Deep Learning are combined with consulting, deployment, and operations services so that customers can quickly build high-quality, high-performance AI-based business systems. Fujitsu regards AI as a core technology that can accelerate digital innovation, and continues to develop technologies in the field. Also, by applying the cutting-edge technologies it has accrued by developing supercomputers, the company aims to push technological transformations even further, helping customers to transform their existing operations and create new businesses. As companies have come to embrace new ways of using data to expand their businesses and transform their operations, they have grown more interested in AI as technology critical to streamlining and accelerating that process. Fujitsu has been working on AI since the 1980s, mostly by Fujitsu Laboratories Ltd., and in November 2015 organized its AI knowledge and technology under the Zinrai framework. Having many of Japan's leading companies as customers, Fujitsu has studied and tested the application of AI to business systems together with more than 300 customer firms. The services being announced represent the technologies and know-how that were found through that process to be especially important to customers using AI. Zinrai Platform Service offers a set of highly practical AI functions proven through more than 300 AI-related business projects and field trials, made available as a service in the form of APIs. A learning-model build function allows customers to easily make learning models appropriate to their operations, rather than just being able to use pre-built models. For customers that require a deep-learning processing platform, this service provides Zinrai Deep Learning, which boasts world-class speeds. 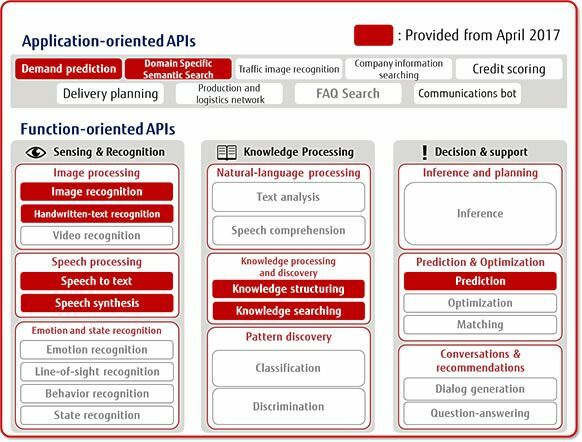 Fujitsu Platform Service provides a total of 30 APIs, comprised of 21 function-oriented APIs, divided into three categories - Sensing & Recognition, Knowledge Processing, and Decision & Support - of building-block technologies, and nine application-oriented APIs, which combine building-block technologies by use case and include functions and knowledge to facilitate the use of AI with customer operations. Customers can quickly put together an AI-powered system by choosing their required APIs. The first offering, to be provided from April 2017, includes 7 function-oriented APIs, such as for image recognition, speech to text, and knowledge searching, as well as two application-oriented APIs, such as demand prediction, with the full range expanding to 30 types of API before April 2018. As part of Zinrai Platform Service, Fujitsu is providing the deep-learning platform service Zinrai Deep Learning, which offers the world's fastest class of learning capacity, using software technology that implements high-speed deep learning(2) and parallel-processing supercomputer technology developed by Fujitsu Laboratories, in conjunction with the Tesla™ P100, the latest GPU(3) from NVIDIA Corporation of the US. Based on this service, customers can combine APIs best meeting their needs, to implement high-speed, high-quality, AI-based systems. To fully support customers' use of AI, from planning to deployment and operations, Fujitsu is providing Zinrai Consulting Service, with which Fujitsu's AI specialists define the best scenarios for using AI based on a customer's business issues and needs; Zinrai Integration Service, to help customers quickly plan and set up AI-powered systems; and Zinrai Operations Service, for maintenance of learning models post-deployment. As the range of applications for AI grows broader, Fujitsu plans to continue implementing building-block AI technologies that Fujitsu Laboratories has taken the lead to develop as APIs. To strengthen the use of AI in edge devices, such as communications devices, robots, and automobiles, the company is equipping Zinrai Platform Service with learning-model distribution functions for such devices. Fujitsu also plans to offer the hardware, software, and services of Zinrai as on-premise packages to customers planning on building their own in-house AI-powered systems. In addition, Fujitsu is developing a proprietary DLU™(4) processor specifically for deep learning, using processor technologies pioneered on the K computer(5) and advanced CMOS(6) technology. This is due to begin shipping in fiscal 2018. Deep learning is the result of 50 years of breakthroughs in AI, but will bring extraordinary social changes, on the same order as the Internet. My hope is that the DLU™ dedicated deep-learning processor will increase Japan's industrial competitiveness at the same time that it contributes to the world. Deep learning is the driving force behind the use of AI, which is referred to as the intellectual industrial revolution. Deep learning opens the door to a vast range of possibilities, but it also requires huge amounts of computational power. Combining NVIDIA's newest, high-end GPU, the Tesla™ P100, with Fujitsu's supercomputer parallelization technologies enables construction of the world's fastest learning environment for deep learning, accelerating the development of high-accuracy models with large-scale neural networks, which will contribute to the creation of new services and products from both our companies. Kazunori Inari, Vice President of Operations, Research Institute of Systems Planning, Inc. Together with the Department of Biomedical Data Intelligence, Graduate School of Medicine, Kyoto University (Professor Yasushi Okuno), our company began research on April 1, 2016, on the theme of "predicting chemical-compound activation using deep learning," and had the opportunity to participate in early access to Zinrai Deep Learning. Using the powerful, multi-GPU environment of Zinrai Deep learning and our own framework for high-speed data feeds, we were able to greatly accelerate our research, the results of which were presented at the 2016 meeting of the Chem-Bio Informatics Society on October 25, 2016. Research Institute of Systems Planning has built a robust partnership with Fujitsu for applying AI technologies to a range of industries, even as we have made progress together with Professor Okuno's lab. Cumulative sales in AI-related businesses of JPY 320 billion by the end of March 31, 2021. See "Fujitsu Develops High-Speed Technology to Process Deep Learning," press release dated August 9, 2016 (http://www.fujitsu.com/global/about/resources/news/press-releases/2016/0809-01.html). Graphics Processing Unit. A processor specially designed to process images; now often used for other purposes thanks to their very high processing speed. A supercomputer and the core system of Japan's Ministry of Education, Culture, Sports, Science and Technology's High Performance Computing Initiative (HPCI), developed jointly by Fujitsu and RIKEN. When it went into general service in 2012, it had an estimated performance in the 10-petaflops range. Complementary Metal-Oxide Semiconductor. A semiconductor characterized by very low power consumption because nearly no current flows when it is in a static state. Used in the CPUs for Fujitsu's mainframes and supercomputers.